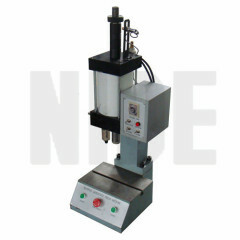 This shaft placing machine can insert shaft into armature core. 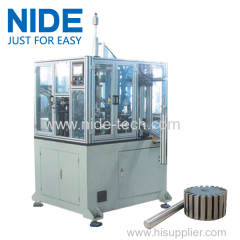 This shaft placing machine is used to press shaft into rotor core. 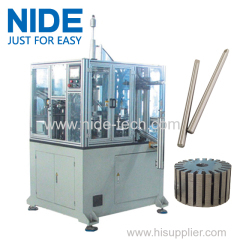 Machine will do the loading, positioning, inserting, and unloading automatically. 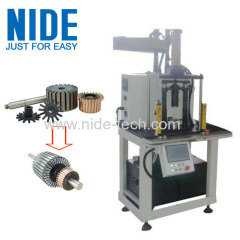 This machine is used to insert shaft into armature core. The pressing part is done by machine. Operator needs to do loading and unloading. 1. Used for pressing shaft into the armature core. 2. Feeding shaft and armature core automatically. 3. Armature OD:20~60mm; Shaft Length:32~250mm. Group of Shaft pressing machine has been presented above, want more	Shaft pressing machine and Shaft inserting machine, Please Contact Us.